Jelly Belly Sours jelly beans in 3.1 oz bags. Five assorted fruit flavors. Great candy for a party, gifts or giveaways. 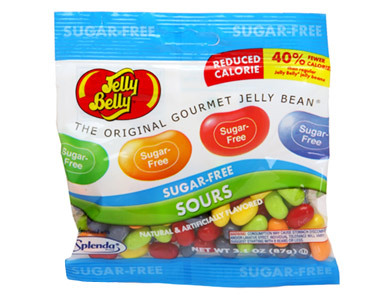 Our Sours have sour power hitched to fabulous Jelly Belly fruit flavors. This collection has soured-up beans in flavors of Sour Apple, Sour Orange, Sour Cherry, Sour Grape and Sour Lemon. Get ready to pucker up! All Jelly Belly jelly beans are certified OU Kosher by the Orthodox Union. I loved the Jelly Belly sours. I can't find them in any regular stores so this place is great! The chocolate bunny is for my brother for Easter. He's diabetic and although he doesn't really indulge in sweets, I thought it would be nice to have something he could have.